Have you ever been in a restaurant with a 40-page menu? So many choices you can't decide. Although this seems like a non sequitur--not to mention a really abrupt way to begin a conversation with someone you haven't spoken to in a long time--I promise it is going somewhere. Oh, & by the way, Hi! So, a few random bits, like the fact that I ate 2 cans of Pringles on the North- & Westward legs of the trip & decided to be "healthier" on the hypotenuse. Hah. I bought ham & cheese & carrots & put them in this little blue zippy cooler thing with a plastic bag of ice, which turned into water way too fast. I successfully kept the stuff cold but it was a pain in the (insert body part here) so at a gas station in some-state-or-other I dumped the ice (I mean water) out of the (now-leaking) plastic bag (only spilling some of it on my shirt) & strode over to an old beater inhabited by a couple of 20-yearish guys & said, "You want this?" & they saw a (to them) oldish woman with water spilled on her shirt & said, "Yeah, thanks, cool." So I went in & bought one of those little halfish Pringles cans & traveled merrily on my way. Oh, & the first day I only traveled 233 miles because I left Rochester very late & then the second day (since I'd only traveled 233 miles, the hypotenuse took 3 days) Motel 6 put me in--spooky Twilight Zone music here--room 233. Cool, huh. So I'm home & I didn't even get to the Twin Cities because by the time I saw people in Rochester I knew if I saw one more person I would pop & that wouldn't be cool. It was the shorter of my 2 planned road trips this year, being only 2742 miles, with the western edge being Minnesota. At the end of August, when my folks celebrate their 50th (happy! truly!) anniversary (is that cool or what?) I was planning to drive there, possible stopping at Minnesota on the way--& maybe Ohio as well--& then shoot down to Phoenix & over to San Francisco & then high-tail it on home, but I have learned from this trip. 1) One destination at a time. By the time the 3rd place rolls around, all I can think about is, I wanna go home! 2) Time away from home is--well, not money, but something. Right now, the idea of the 6-week road trip (like the one I took in 2005 during my address-less period) is NOT fun. I'd rather do a wham-bam-thank-you--err--folks so I enjoy everybody & they (I hope) enjoy me. So, to those of you whose paths I did not cross during this trip, though I was less than 200 miles away, I don't exactly apologize, but I do look forward to seeing you when I'm not over-socialized & over-traveled & pining for the hills of (now) home. I'll fly out & see you sometime or--hey, the sky goes both ways--you can come see me! So, those are a few items from the rich & varied & lengthy menu that was the last 26 days. I need a haircut. I got new tires, courtesy of Zach. Haircut is on Tuesday. My little car got hailed on in Minnesota. It's still fabulous. In case you were wondering, the photo is from a secret art mission that I was fortunate enough to help with. Most of the stencils we did on horizontal surfaces, which worked very well, but Becca decided we needed to do a couple on walls & here is one result. 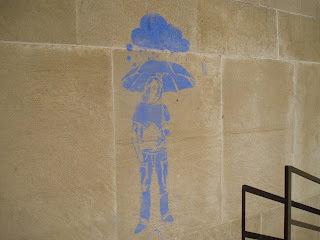 Becca was right, the Mudd Library DID need a rainy guy, but Nick & I--because we held the stencil against the concrete while Becca rolled the chalk dust on--were completely covered with blue chalk. It was fabulous. But secret, of course, so don't tell anyone. 131. Buy yourself flowers & arrange them--if only haphazardly.